The Collins Employees Amateur Radio Club is open to all employees, retirees and family members. We don’t have formal meetings and tend to keep in touch via email. The W4CRC club station in building 307. Our club station is in Melbourne's Engineering building 307. 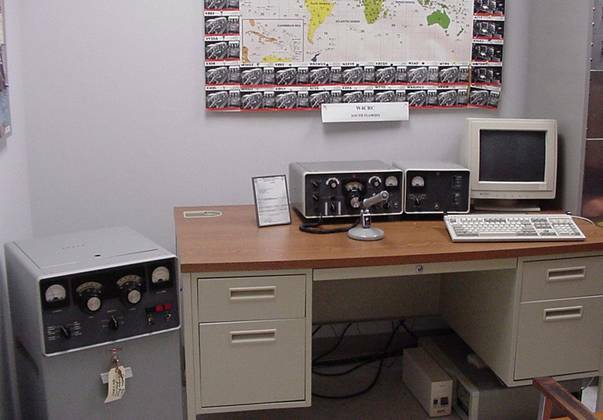 It consists of a classic round emblem KWM-2A with all service bulletins, a 312B-4 station console, 516F-2 power supply, and a 30S-1 kilowatt linear. The big antenna is a Hy-Gain HF Log Periodic at 85 feet. It covers 6 to 30 MHz. We’ve recently added an inverted vee for 80 meters and a long wire and tuner. send email to Chris Meehan or Bruce Jack. You can find their email address' from the inside. If you have anything related to ham radio that you’d like to send to the group, use the same address. Valid topics are “For Sale” of amateur radio – or amateur radio-related items. Announcements of hamfests, swap meets, club functions or classes are also welcome. The American Radio Relay League. Click on the 'What is Ham Radio' link. The Collins Employees Amateur Radio Club is solely responsible for the content of this Web Site.